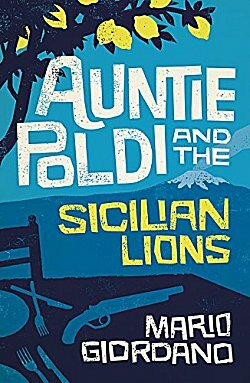 First Line: On her sixtieth birthday, my Auntie Poldi moved to Sicily, intending to drink herself comfortably to death with a sea view. As with all best-laid plans, Auntie Poldi's goes astray when she finds the dead body of a young man on the beach. For a short time, she's a suspect in the murder but soon she and the handsome Commissario Vito Montana have formed an investigative partnership that Poldi is hoping will turn into a romantic one. Auntie Poldi and the Sicilian Lions is told to Poldi's nephew who comes to visit each month from Germany. His aunt is a force of nature, and he is often appalled at some of her antics. Already familiar with Sicily from Andrea Camilleri's Inspector Montalbano mysteries, I enjoyed reading a mystery set on the opposite side of the island where the shadow of the Etna volcano looms over all. Giordano's setting is good, so is the mystery, and the food is mouthwatering. There are flashes of humor throughout the book, especially where they concern the mishaps Poldi has with her wig. This first book in a series is good but for me, the story didn't really shine. I don't know if this is due to the translation or awkwardness because the nephew tells us the story secondhand. What I do know is that I'll be reading the next book in the series to see what happens next. That setting is irresistible, Cathy! And the premise works, too. I can see why you found plenty of things to like. I have to have a backup just in case Montalbano stops solving crimes in Sicily!